How can I buy the digital vignette? Enter the vehicle type (car or motorbike) the country of registration, the vehicle licence plate number of your vehicle and the start of validity of the vignette. Enter the e-mail address to which the invoice confirmation should be sent and choose the payment method required. You may choose between credit card, PayPal or Sofortüberweisung. Note: Currently it is only possible to pay by credit card or Paypal in the “Unterwegs” app. You can also purchase several vignettes and route toll tickets in one transaction. Basically, you have two possibilities to purchase a digital vignette, either with or without registration in the customer portal. Furthermore, you also have the opportunity to buy the digital vignette from selected distributors. What information do I need to provide when purchasing a digital vignette? You give us the licence plate number of your vehicle, the country of registration, an e-mail address and the desired cashless payment method (credit card, PayPal or Klarna Sofort). We will send you the invoice confirmation via the e-mail address. How long is the digital vignette valid and what does it cost? As with the adhesive toll sticker, there are ten-day, two-month, and annual vignettes available. The digital annual vignette is also valid for 14 months, from 1 December 2017 to 31 January 2019. There is also no difference in the prices. Can I combine the purchase of a digital vignette with the purchase of a route toll? Yes, you can buy several products in one order process. After each step in the purchase process (product selection, My data and order overview) there is the possibility to select further products. Simply click on "Select other products" at the end of the page. All of the products you have entered are put into the shopping cart and can be edited or deleted. For example, you can buy a 10-day vignette for your holiday trip to Italy, as well as the matching route toll for the A 13 Brenner motorway or A 10 Tauern motorway in one order process. After selecting the desired route, the year and the date of validity, enter the code (the number beneath the bar code) in the next field on the lower section of the annual vignette. In the background, the system automatically checks whether there is already a digital annual vignette for the licence plate number (together with the country of registration) that has not yet been used to claim a discount. The discount of Euro 40 is shown in the order overview and is deducted automatically. I have received a scratch card for a digital vignette with a registration code from the Ministry of Social Affairs or via a subscription campaign. What do I do? Select Passenger Cars and then click on "Annual Vignette"
Enter the licence plate number, the country of registration and the uncovered registration code in the "Registration code" field. Finally, enter your e-mail address - you will receive a confirmation e-mail. If the digital vignette is purchased with a registration code (scratch card), it is valid immediately after redemption in the webshop - the consumer protection period is cancelled. I have an interchangeable licence plate. Does this mean that I need several vignettes? No - the digital vignette is bound to the licence plate number, meaning that: If you are an owner of an interchangeable licence plate, pay the fee for the digital vignette for this licence plate and you can use highways and expressways with up to three different vehicles. Can I also buy the Digital Vignette in a tobacconist, petrol station or motorist club? ou can also purchase the Digital Vignette at the sales offices of the ÖAMTC, ARBÖ and ADAC, in various petrol stations and tobacconists, as well as at the ASFINAG toll stations. An up-to-date list of outlets can be found at Sales Outlets and in our App. Payment can only be made cashless by credit or debit card. 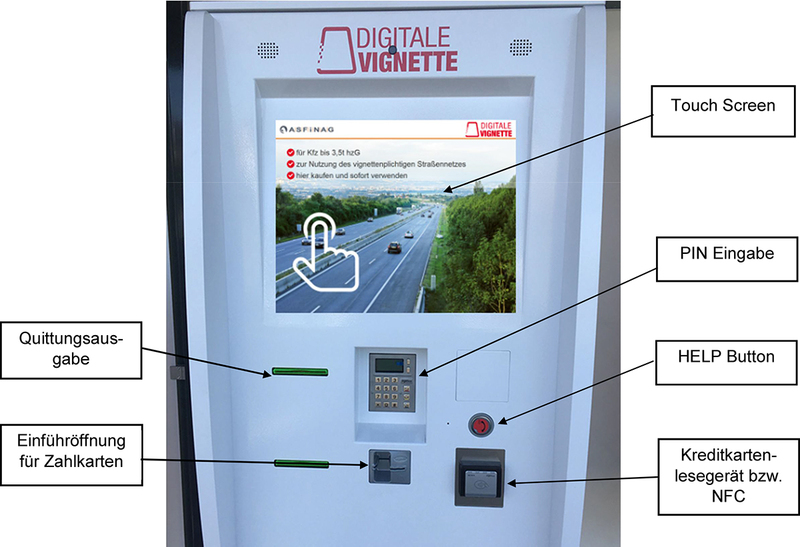 Good to know: When you buy a Digital Vignette from one of our sales partners, at the ASFINAG toll stations or the vending machines the consumer protection period of 18 days does not apply: the digital vignette will be valid immediately. Please note: We do not sell digital vignettes at ASFINAG's office locations or motorway maintenance centers. Is it possible to switch between an adhesive and a digital vignette at any time? It is not possible to change during the validity period of the vignette. Therefore, if you have purchased an annual adhesive vignette it is not possible to change to a digital vignette during the year of validity (1 December 2017 to 31. January 2019). The reverse is also not possible. For the following vignette year, however, you may decide which form of vignette you would prefer. Exception: If a windscreen on which an adhesive toll sticker is fixed is broken, we support free, uncomplicated and rapid change to a digital toll sticker. Which changes are possible after purchasing the Digital Vignette? All changes require the customer to register in the customer portal. Changes relating to your personal information such as the e-mail address, password or invoice address (optional), can be made at any time and free of charge. Any changes affecting the purchased product such as change of validity or the vehicle licence plate number, can only be made free of charge before the start of validity. Example 1: You have purchased a 10-day vignette, valid from July 10th. However, your holiday is delayed and you will not leave until July 24th. Now you must alter the beginning of the validity of your vignette in your account by 9th July (23:59 clock) at the latest. Example 2: You have purchased a 2-month vignette, which is valid from 16th March. You move home before the validity of your vignette begins and you are issued a new licence plate number, you have entered an incorrect licence plate number by mistake or you wish to use an already purchased vignette for a different licence plate number. For the above cases you must change the data in your account by 15th March (11:59 pm) at the latest. The vehicle suffers total accident damage and is written off. In the cases of stolen or lost vehicle or licence plate number or total damage of the vehicle you will receive a refund for expenses of 18 Euro. Please note that changes to the approval holder are generally not possible! ATTENTION: In the app changes of the license plate are only possible before the start of validity. License plate changes after the date of validity are only possible in the webshop via Asfinag.at. I have entered the licence plate number incorrectly. What do I do now? As long as the validity of your vignette / route toll ticket has not yet begun, you can change the licence plate number easily and free of charge. As an already registered customer just log in to your account and click on "My Products". Select the product with the incorrect licence plate number and make the necessary correction. Still haven’t created an account? To create an account, click on the menu item "My Account" and then on "Create a new account". Here you can choose between a consumer or a company and enter your data. After creating the account, click on "My Account" and "Assign Products". In the box provided, enter the product ID of your already purchased product. These ID can be found on your order confirmation. Please note: In order for the products to be assigned to your customer account, the e-mail address provided at the time of purchase must match the e-mail address of your customer account. Changes to the licence plate number after the date of validity are only possible for the yearly Digital Vignette and the yearly digital section toll only in certain cases. I have borrowed or hired a vehicle. How do I know if the car has a valid digital vignette? Use the publicly accessible register referred to as the vignette register to check whether the car or motorbike has a valid digital vignette. Entering the licence plate number and the country or registration displays information regarding the type of vehicle (car or motorbike) and the validity of the associated vignette. If a route toll has been purchased for the licence plate number, information is also provided regarding the route for which the ticket was purchased and the exact validity periods. Further information on the vehicle owner is not included in this register. Good to know: A maximum of three queries in one day is possible from one and the same device (desktop, laptop, tablet or smartphone). This prevents an extensive wide-ranging check being performed. How do I register in the customer portal? To create an account, click on the "My Account" menu item and then on "Create a new account". Here, you can choose between a consumer or a company and enter your data. Only your e-mail address and password are required. A confirmation of registration will be sent to you by e-mail. Don`t worry! Your information will, of course, be kept confidential and will not be passed on to third parties. As a registered customer you have direct access to your purchased products and can benefit from our additional services such as Changing the car licence plate number, the period of validity of your products or your customer information. If you forget your password you can request a new password quickly and easily. Enter the e-mail address for your customer account and click "Reset password". You will then receive an e-mail with a link. You can enter a new password for your account in the page that now opens. My e-mail address with which I registered has changed. What can I do? Please note that the e-mail address deposited in your customer account can not be changed. To use a different email address, please create a new account with your new email address. Under "Assign product to my account", you then assign your already purchased products to your new customer account. After that you have to delete your old customer account under "my data". Right of withdrawal policy: Why is a digital vignette immediately valid in other countries, but not in Austria? In Austria, the Telecommunications and Foreign Trade Act (Fern- und Auswärtsgeschäfte-Gesetz (FAGG)) is the basis for every online purchase. This requires that customers may withdraw within 14 days from buying any product they have purchased online. This deadline also applies to digital products such as the digital vignette or digital route toll. Why is the vignette valid on the 18th day after purchase? Customers can withdraw from the online purchase of a product or service within 14 days - this is also the case when purchasing the digital vignette. The day of purchase is not counted as one of these 14 days. As the withdrawal can also be sent by post, we allow a further three days for postage. Therefore, the digital vignette is only valid from the 18th day after the date of the online purchase and is only then valid to use the motorways and expressways in Austria. Buy the digital annual vignette by 13th November at the latest, so that it is valid from 1st December or until at least by the 14th of January, so that it is valid with effect from 1 February (beginning of the new vignette year). Can I waive the right of withdraw and have my vignette valid immediately? No, that is not possible. To protect the customers, the Telecommunications and Foreign Trade Act (Fern- und Auswärtsgeschäfte-Gesetz (FAGG)) does not allow consumers to waive the right of withdrawal. Companies are the exempted from to this regulation for which the right of withdrawal does not apply. I am a company. What do I have to consider when buying a digital vignette? The only difference regarding the purchase as a private individual, is that the consumer protection period does not apply to companies. This means that the digital vignette is valid immediately. By activating a checkbox on the homepage, you indicate that you are a company. This is a clear declaration that indicates that you are buying the digital vignette for business purposes. How is the digital vignette controlled? Although the Digital Vignette is linked to the number plate, there will be no comprehensive number plate checks. Like with the traditional toll sticker, ASFINAG only performs random checks of the Digital Vignette. As always, our colleagues from service and controls (Service- und Kontrolldienst) (around 100 staff members) ensure that the toll has been paid. There will only be up to twenty automatic toll sticker control cameras on more than 2,200 kilometres of motorways and expressways. These cameras are mobile and change location regularly. The control systems only store the data of vehicles without a valid traditional toll sticker or Digital Vignette. These data are exclusively used as evidence for toll-related offences and to handle the toll fine claims. No other data are stored or are accessible in any way.